Efficient and clear communication is essential in the youth ministry world, whether it be between the Sr. Pastor and the Youth Pastor, student and volunteer, or between parents and youth workers. 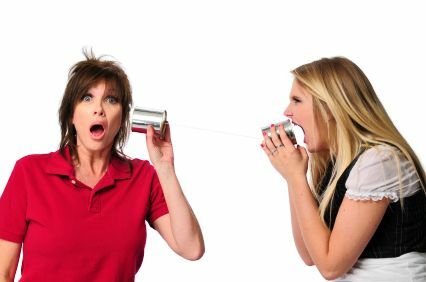 Yet too often, we are not as aware as we coupld be of the skills of good communication. Yes, we were trained in the art of speaking, preaching, and teaching but rarely are we taught how to listen well. Good communication requires first of all quieting the the internal dialogue which often prevents us from listening clearly to others. Particularly if we have a lot of negative or destructive ruminations swimming in our minds, we need to learn to still these internal voices. When our internal world is quiet and calm, a balanced emotional awareness can develop and we are more able to see and hear others clearly. We are also more likely to hear that small, still voice that guides us. Next, we need to be able to listen. Listening is a developed skill which requires practice and attention. One of the keys to good listening is to avoid formulating a response until the person speaking is completely finished. This is hard for us because we are training in the art of arguing our agenda. If we are busy thinking of what we’re going to say next, we are probably not absorbing what the speaker is saying. The next time you speak with a student or the Sr. Pastor, make a point of listening without reacting until they are finished speaking. Then pause for a moment, take a deep breath, and let the other person know you have heard what they said before you proceed with your own feelings or opinions. Repeating another person’s main messages for clarification is also useful. You’ll be surprised sometimes at the difference between what you heard and what the speaker thought they said. Discussing this can be very helpful. In ministry, mistaken communication can come back to haunt you, so taking the time for clarification is very important. Paying attention to nonverbal communication is just as important as listening carefully to verbal messages. We communicate through our body language – gestures, eye movement, facial expressions, posture – just as much as through our words. Good communicators know how to listen and respond to this nonverbal communication. For instance, if a student assures you that things are going fine at home, but fidgets and looks nervously towards the door as they speak, you may want to gently inquire further about some of the specifics of the situation. Make eye contact and use a gentle tone of voice when responding to these nonverbal clues. Often a person expresses things through their body when they are uncomfortable articulating them openly. If we remain calm and show respect for the student’s feeling, the student is more likely to feel that they can express their thoughts more directly. Everyone benefits when communication is open and clear. One final thought…when talking with others, as far as it’s possible by you, suspend immediate judgement whenever you can. For example, a young teenage girl takes a huge risk by sharing with you that she cuts herself when she’s upset. If you’re immediate response is to overreact and shame her or express disgust, you have effectively closed the door on the discussion. She has just interpreted that as you cannot be trusted with sensitive information. There will be a time to challenge certain beliefs and behaviors but keep the conversational door open long enough to establish trust and earn the opportunity to be heard. The other person will be much more likely to hear what you have to say then.